Jakub keeps investing in the F18, he has fabricated a new extrusion for his own F18 Alu masts. He also has been working on stock por snuffers, booms, spin poles, mast base he is finishing now and all the F18 parts needed to equip a full built Exploder from factory, including self tack etc. remember you also have the chance to order parts and assemble yourself, as I did with boat above, including a custom self tack system on a local Harken high rail I used for the Racecat F18s. Exploder Production boats have been sold already of a stock they've built. Contact Jakub at exploder.info or us at catsailingnews gmail com for more info. 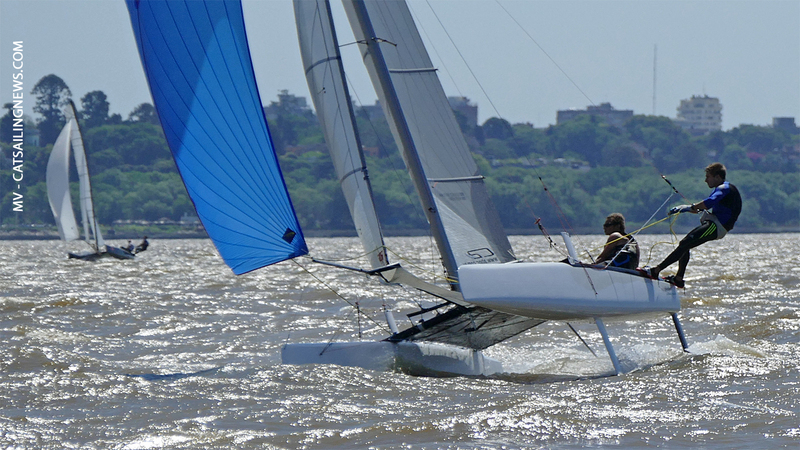 The hulls in stock will be the ones available until the end of the A-Class Worlds in Medemblik in June, after that Exploder will begin again to produce F18 hulls. Meanwhile Jakub is preparing mentioned parts above. Some good news on costs from other brands are welcome like Goodall Design and the Australian dollar exchange, more details later in the week. Local Exploder platform for the 2016 Worlds will continue to use Goodall Design Rig , Main & Jib. Spi they will keep the Nacra one, the same used by Gunnar at Kiel. For current times we need to transform again the F18 in a more accessible Class, materials selected by founding members wisely targeted low costs. But right now at same price new foiling toys are taking a huge crunch of the market, I can confirm first hand carbon A-Class & recreational foilers like the Stunt 9, Whisper and others are taking the sales. The local old F18 guard buying boats every year (as also development and news boats were available each year) has stop that process which helped greatly to help growing the local Class and are now investing in As , Foilers etc. They continue to race but no new F18 sales beyond the Exploder reported. No new sales = no growth = Fleet stagnation. The main assets of the F18 are the multiple alternatives racing 1 to 1 inside a Rule Box, a framework favoring inexpensive construction materials (compared to Carbon hulls/masts, Nomex, Epoxy and else) and fleet numbers. The F18 still have the fleets Worldwide, but we need to maintain now and keep growing, new boat sales have been going down since 2012, a good indication being new isaf plaques. With the F18 OP and Exploder our goal is to revert that scenario and to give new air to this great racing Class. Another push will be having Sarasota Sailing Squadron hosting the 2018 Worlds in the US. In 2012 we went to the west coast to a great event in Los Angeles hosted by John Williams and the Alamitos Bay Sailing Club. This was voted in the WC with a 100% support from all NCAs. 2017 will be held at Denmark. I will propose to the WC to have Punta Ala in 2019 and Croatia in 2020. Those will be spots everyone will be eager to attend and will keep the momentum going for the Class. I will certainly try to attend both! Punta Ala is simply a perfect venue and the Croatian coasts look great place to race and visit too. Buenos Aires, Denmark, US West coast, Punta Ala and Croatia complete a great combo to get the Class growing path. 2021 we need to go back to Australia or maybe New Zealand. This will be an historic one for the F18, with the first Worlds to held in South America, in our home waters. 4.1 Entries received until 31st July 2016 will qualify for the early entry fee Euros 250. 4.2 Entries received from 1st August and not later than 14th October will qualify for the late entry fee Euros 350. 4.3 The Entry fee has to be paid via the entry form online. For container details being prepared from Europe remember to contact Nacra in the NED & Exploder in Poland. The IF18CA officials also have the info on this. Arg racing season will start in a few days and will keep updates on the events and some charters available. Right now I can confirm a Nacra MKI with board upgrade in good shape, and a Phantom F18 2013. Contact me directly too on this for details.